Melissa O'Neil, Anthony Lemke & Alex Mallari Jr.
Waking up with no memory of who you are or what you doing is never good. Especially not when it happens in dystopian far away future on a space ship. It happens to a crew on Dark Matter who try and find answers with the help of a female Android. Where can you stream Dark Matter? 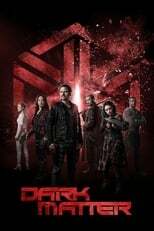 On 2015-06-12 Science Fiction/Drama TV Series Dark Matter first aired on Syfy. Written and created by Paul Mullie & Joseph Mallozzi, and produced by Prodigy Pictures Inc, .